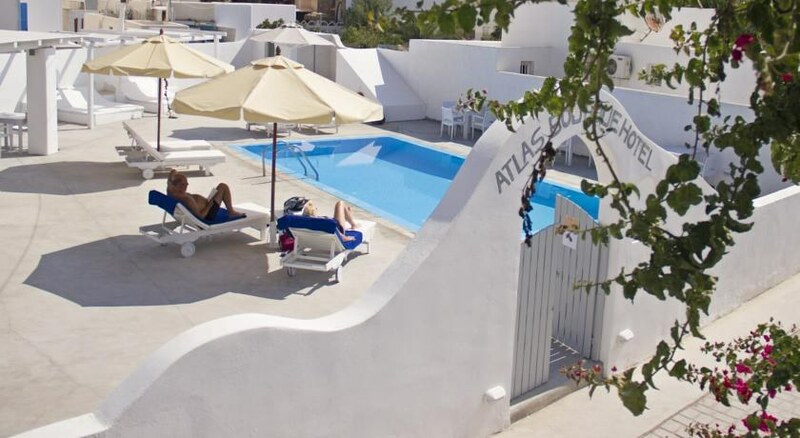 Atlas Boutique Hotel is a family friendly new Boutique Hotel located near the magnificent black sand beach of Kamari in sunny Santorini and has been fully renovated in 2014. The beach is barely a minute’s walk away. Featuring a seasonal outdoor pool, sun terrace and a snack bar, the hotel invites guests to relax in ultimate comfort with all modern amenities and warm hospitality. Immaculate, well-appointed guestrooms in contemporary décor come with air-conditioning, a flat screen satellite TV, free Wi-Fi and refrigerator. Rooms open to a balcony with garden views, while some others open to a balcony with magnificent sea views. The Santorini International Airport is within easy reach, just 3.5km away. “Kamari” which in Greek means pride and joy lends its name to the beautiful black volcanic beach of Kamari village. The landscape is akin to that of Perissa, the beach is covered by black sand and an enormous rock called Mesa Vouno rises dramatically from the sea on the left side. A well-organised beach, it offers a wide range of facilities like sunbeds, umbrellas and various water sports activities. The beach is lined by rows of traditional cottages and tavernas, offering a magnificent view to the sea. A winding road takes you up to Ancient Thira runs, and ferries ply to the beautiful Amalfi islands. 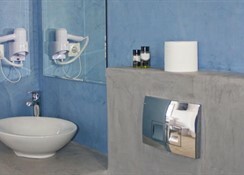 Atlas Boutique Hotel is located near the magnificent black sand beach of Kamari in sunny Santorini. The beach is barely 50m, a minute’s walk away. The Winery is 2.8 km from the property while Santorini Airport is 3.5 km away. A winding road from Kamari takes you up to Ancient Thira runs, and ferries ply to the beautiful Amalfi islands. 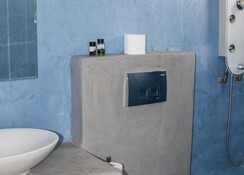 Rooms at Atlas Boutique Hotel come in Superior Double or Suites. These well-appointed units furnished in modern décor come with Air-conditioning, fridge, safety deposit boxes, satellite TV, Wi–Fi and en-suite private bathroom facilities. The Superior Doubles rooms come with private outdoor Jacuzzi and Suites come with separate bedroom (up to 4 pax) and private outdoor Jacuzzi. There are lovely balconies which provide magnificent views of the sea and the surroundings. There is a snack bar at the hotel where guests can order light bites and refreshing drinks. Kamari’s favourite bars and restaurants are in close proximity if the guests wish to try them out. Atlas Boutique Hotel has a swimming pool besides having easy access to the black sand beach. There is a lovely sun terrace where guests can soak up all the sun. A lovely garden surrounds the hotel where guests can take a leisurely stroll. There is a snack bar where guests can enjoy snacks and drinks. Shuttle services are available. The hotel can provide assistance at a tour desk for organising local excursions and sightseeing. 24-hour front desk Outdoors sun terrace Terrace garden Swimming pool Outdoor Pool (seasonal) Snack bar Family rooms Air conditioning Tour desk Shuttle service (additional charge) Airport shuttle (additional charge) Daily maid service Shuttle service No parking available Free! Wi-Fi is available in public areas and is free of charge.